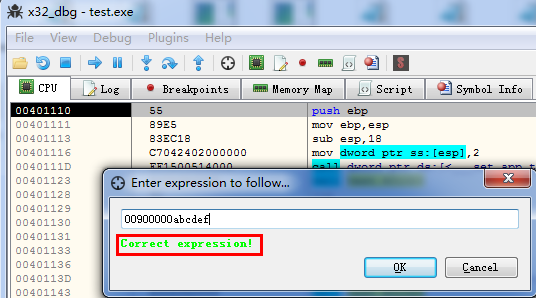 mayby name to eXoDia's x86 & x64 debugger fells better, what do you think so? @mr exodia - where should i look for the helpfile? its included int he bin_release folder? yes it takes all time - already a dope debugger. one cant imagine how long it takes to write something like a debugger. New release available in public_bin. Fully cleaned up the repo, added many features & fixed the bug from cyberbob. PS Please report bugs if you find any, we will fix it as soon as we can. in which folder on the bitbucket page i should look for this update? We are working hard on the features requested, they are all on the todo list. There is a crashdump.Just add a lebal operation,include a pic. I found two another problems. One is about hardware breakpoint,I set a harware breakpint in the CPU window,it cannot be deleted in the BreakPoint window,and there is also no VA address and Module name in that list.Software breakpoint does not. The other is Expression.I drag the "test.exe" file to x32_dbg,and its IB is 0x00401000,but if I enter a high address like 00900000abcd,it still shows correct . @Hellsp@wn: Will be fixed in the next release probably. awesome, just give it time, it should work perfect smooth and stable. in the future will support both scripts and plugins as Strong, Phantom? I think I have some free time left. Maybe I could help somehow. I don't know anything about Qt and I don't want to learn it to be honest. So I could do anything except GUI/Qt development. Tell me if you have some "job" for me.